Fletcher is currently working on a mid-career survey of the award winning artist-led collective Otolith Group and has recently curated or co-curated projects including the midcareer surveys of Qiu Zhijie, Hito Steyerl, Sheela Gowda David Malkjovic all at Van Abbemuseum. She has worked on the Museum of Arte Útil with Tania Bruguera, which opened in the autumn of 2013 at the Van Abbemuseum and developed the award winning two year programme Be(com)ing Dutch. She was co-founder and co-director of the rolling curatorial platform If I Can’t Dance, I Don’t Want To Be Part Of Your Revolution with Frederique Bergholtz and Tanja Elstgeest (2005-10). As a writer she has contributed to various magazines including Afterall, Metropolis M and other publications. Annie Fletcher will take up the post of Director on 1st March 2019. IMMA is Ireland’s National Cultural Institution for Contemporary Art. Our diverse and ambitious programme comprises exhibitions, commissions and projects by leading Irish and international artists, as well as a rich engagement and learning programme which together provides audiences of all ages the opportunity to connect with contemporary art and unlock their creativity. IMMA is home to the National Collection of modern and contemporary Art, started in 1990 and now numbering over 3,500 artworks by Irish and international artists. We make this national resource available through exhibitions at IMMA and other venues nationally and internationally, engagement and learning programmes and digital resources. IMMA’s programme reimagines ‘the Museum’ as an open and participatory space that connects people to contemporary life through art. Our audience come to IMMA to experience something new and to share knowledge and new thinking. Recent developments in the programme have expanded beyond the gallery space into the full site of IMMA’s home at the Royal Hospital Kilmainham. A programme of live performance, making, music, food and gardening invites the audience into a direct interaction with creativity, and provides a space for debate, inspiration and participation. IMMA has a large and engaged audience. Physical visitors have grown by 90% since 2014 and over 489,000 people visited IMMA in 2017 making it the sixth most visited free attraction in Ireland. IMMA’s audience is young, with over 65% of visitors aged under 44. 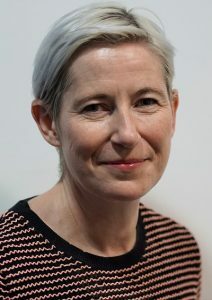 Previous IMMA Director Sarah Glennie, who led the museum from 2012 to the end of 2017, is now Director of the National College of Art and Design.